In our previous post, titled “what to avoid in a home restoration company,” we took a slightly cynical look at our own industry – that of disaster restoration. And while the look might have been cynical it was also important; we outlined warning signs for folks in need of home or commercial restoration services. Whether you are in Missoula, the surrounding area, or thousands of miles away, you should go back and check out some of the practical tips we provided. If, however, you aren’t feeling particularly negative today (or you’d just like the Reader’s Digest version, as it were), here’s a brief summary. Demanding a big down payment – Fight against the impulse to exclusively care about how quickly a disaster restoration contractor can solve your problem. We understand this is difficult, but it’s vital to not let an untrustworthy restoration company take advantage of your state of mind. Less-than-reputable contractors will often demand down payments that are much too high. Get multiple quotes if you have the choice to do so. A quick quote – Don’t be fooled by any restoration company that can give you a confident over-the-phone estimate. It’s akin to the point above, but our particular point of emphasis here is that no restoration company worth their salt will give you an exact estimate without closely examining the unique situation. Ask for paperwork – Bad restoration companies aren’t thorough and won’t volunteer paperwork, like proof of insurance, licensure, and a formal, written estimate. Hence, perhaps the most important characteristic a water restoration company ought to have (aside from being reputable in the first place) is that of urgency. At HiCrest Restoration, we provide Western Montana with top restoration and cleaning services for folks who need it and they need it now! Keep reading to find out some other significant qualities you should look for in a water damage cleanup contractor. Top restoration companies, like our own (if we do say so ourselves), offer a range of disaster restoration services. It’s often the case that one kind of disaster might beget another, meaning that you require flood damage repair, a sewage cleanup company, and professional carpet cleaning services all in one-fell-swoop. Being able to “bundle” these services can save you money and time. What’s more, saving time might save you money as we’ve noted above, because you can stop the ongoing damage in its tracks. At HiCrest Restoration & Clean, we offer a comprehensive suite of services. Whether you are looking for storm damage, carpet cleaning, smoke and fire damage, mold removal, commercial restoration, or even 24/7 emergency disaster restoration, we are Missoula’s best restoration company for good reason! We mentioned that you should avoid working with a restoration company if they won’t offer proof of their certifications, bonds, or insurance. At HiCrest Restoration & Clean, our disaster remediation technicians are completely certified to restore and clean your property. Plus, we have no problem offering you documentation of that fact should you require it! You should also know that our credentials come from the top cleaning associations in the industry. We offer 24/7 emergency restoration services for Missoula and beyond. Our technicians are on standby, ready to tackle whatever the problem is day or night. We know that these emergencies can’t wait, so be sure to give us a call if you need trusted professionals on the scene. 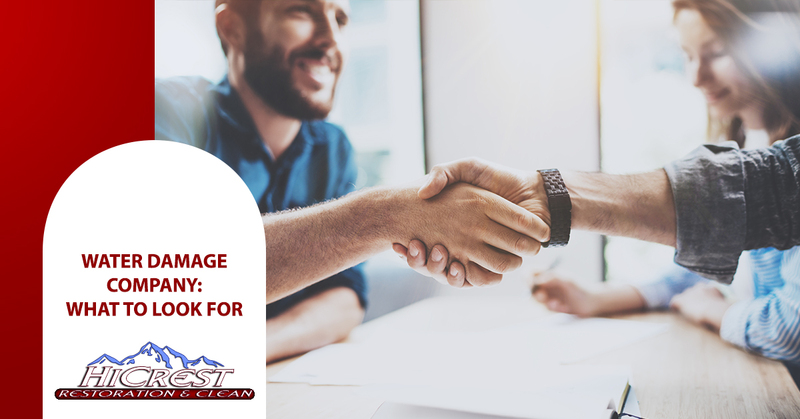 If you work with a high-quality, affordable restoration company like HiCrest Restoration & Clean, you’ll likely get offered a thorough follow-up service to make sure the restoration project has remained on track and successful. We’ll make sure all the work performed is up to our standards and you are still satisfied by it. When it comes to water or storm damage, hiring a company that is comprehensive is vital to the longevity of your home or place of business. Why? Water damage is no joke, as it easily can irreparably destroy the integrity of your home’s structure. That’s why efficiency and quality are two of the values we hang our hats on here at HiCrest Restoration & Clean – having one without the other is pretty much useless! Doing business with good people means you’ll be getting reliable service, no matter the industry in question. When it comes to disaster remediation, you’ll want to be confident in the folks you entrust to solve your issue. We here at HiCrest Restoration & Clean are honored to serve the Missoula community which we call home. We’ll walk you through every step of the process to make sure you are not only comfortable but confident with what is going on. We do our best to go above and beyond the expectations of our clients so that they can feel at ease and focus on taking care of their family and livelihood during this difficult time – instead of micromanaging your local water restoration contractor. Put simply, we know what we are doing, and we’ll get the job done quickly for an affordable price. That’s the difference at HiCrest Restoration of Missoula. We hope you’ve enjoyed this look into what makes a restoration contractor or company worth giving your business to. At HiCrest, all of our team members are 100 percent certified for both residential and commercial work. And despite the fact that we’ve been highlighting our water damage services today, don’t forget we offer mold removal, carpet cleaning services, smoke and fire damage cleanup, and emergency disaster services. Make your house home again with Missoula’s top restoration company. Contact us today and we will go from there.